Ask fellow campers about "Elk Lodge #849" and nearby attractions. This Elks Club has five sites with 50 amp and water. Those sites are $10 and the bartender (who you pay) said that this time of year those sites are always full. There are three long, dedicated dry camping sites near the sites with hookups but you can dry camp wherever there is room enough to park your rig. All of the sites are in the paved parking lot and the sites are level. Verizon service was good. Food is now only served on Wednesday nights. There is a Discount tire with a large parking lot next to the lodge and several loud cars seemed to come and go through there at night making sleep difficult on a hot night with no A/C. 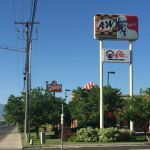 The lodge is located a short ways off of I-15 and the sign for the lodge is difficult to see as it sits below the sign for KFC (see photos). There is a suicide lane so you will have plenty of room to make your turn into the divided entrance road (there's a concrete median on the entrance road to the Elks to divide the entrance road lane from the exit road lane). We camped at Elk Lodge #849 in a Motorhome. Chuck-a-Rama is right across the street. A great buffet restuarant. 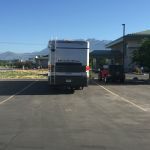 Very clean RV spaces on concrete with room to park car in front of RV. Bar and food available as in most Elks Lodges or fast food type places within easy walking distance. We took the last available full hook up site but there are several designated dry camp spots and other areas where one could park if there are many campers. Entry into the Elks is tight, just past A&W/KFC store. Give yourself plenty of space from oncoming cars as you turn across traffic. I'd suggest ALWAYS entering from the south and turning across traffic to get your rig straight as possible going into the driveway. We camped at Elk Lodge #849 in a Motorhome. Easy on and off. 5 sites full hook ups. Pay at Bar. Plenty off food and shopping close by. Been here numerous time and always had room. Beautiful Elks Lodge. 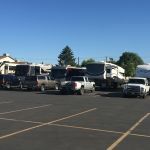 RV Parking for Elks ONLY. We camped at Elk Lodge #849 in a Fifth Wheel. We stay here every time we come through Provo. The first drink in the lodge is free for the RVers. The only problem I have found it the sewer is so elevated it really can't be used unless you stand out there and hold your hose up. We will definitely stay here again when in the area. We camped at Elk Lodge #849 in a Motorhome. Another great Elks Lodge with full hook ups. The bar is has convenient hours and a good selection. Level sites fully paved back in spaces. Must be Elk member in good standing. We camped at Elk Lodge #849 in a Motorhome. As everyone has mentioned this is for Elks members and their guest. We stayed 5 days. Utilities are very strong. Have a water pressure regulator as it is 85 psi. Fifty-30-20 amp service. Strong TV on manual antenna. Wi-Fi is very weak at the RV. We used our Wi-Fi booster and got a decent signal. Near or inside the Lodge, Wi-Fi is excellent with a 15 meg download! Dinners are now on Wednesday evening. One of the nicest, most modern lodge we've been to. This is our second trip back. If all sites are full you can boondock near the sites for $5.00 We camped at Elk Lodge #849 in a Fifth Wheel. This is available to Elks Members only and is a great stop when traveling in this area. We have stayed here several times. Long back in full hook up sites in the rear of their building. Definitely will stop here again. We camped at Elk Lodge #849 in a Motorhome. 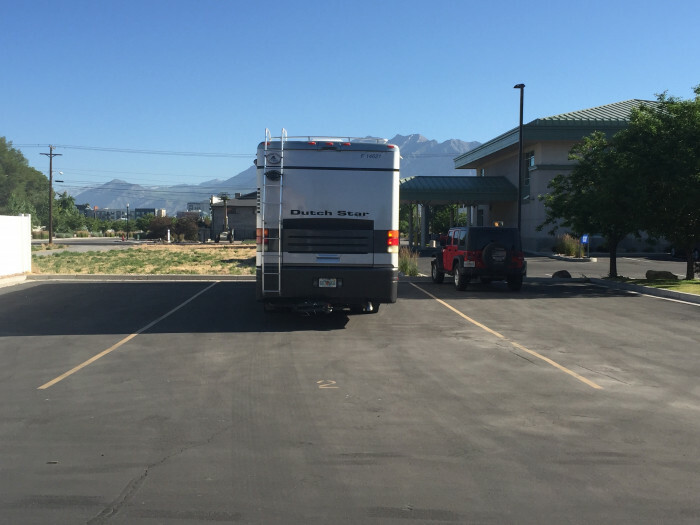 Glad the previous review was available as we hadn't realized that the Provo Elks Lodge had RV sites. 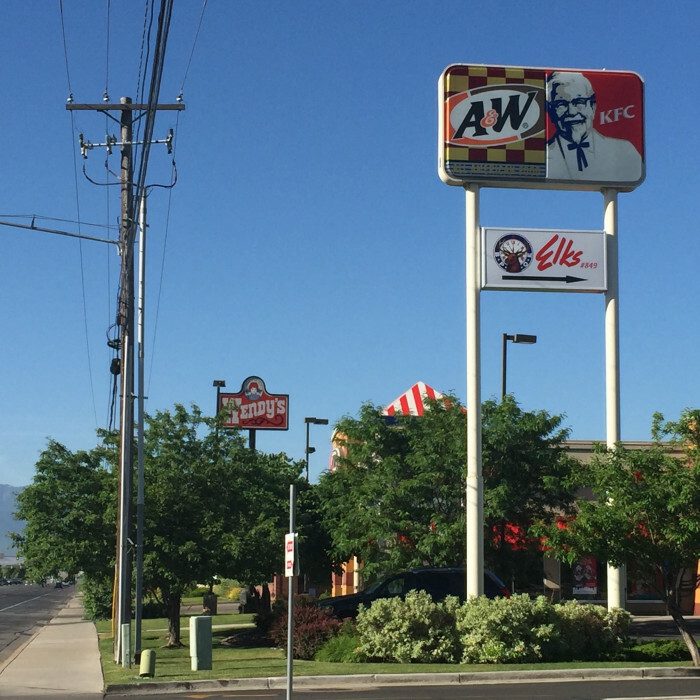 We had trouble finding it because it sits back off University Ave. You must enter between the KFC and Al's Barbecue. This is a tight turn but doable even in a forty foot motorhome. This is a very nice and friendly club. Their Friday night dinners are very good: full menu. The special tonight was prime rib and our meal for two cost about $24. Very nice service. The RV sites are wide but just on a paved lot, nothing fancy. We would come back. We camped at Elk Lodge #849 in a Motorhome. This is a very nice Elks club. Strictly for Elk members and their guests. 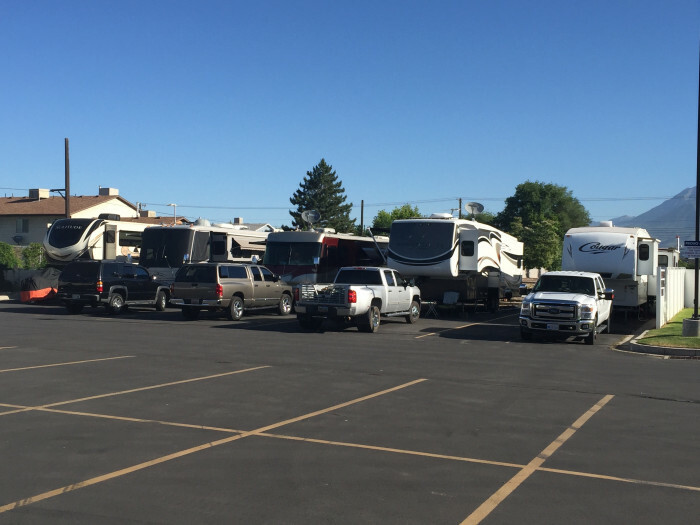 The RV section is at the back of the parking lot and asphalt. The sewer hookup is a little difficult since it is elevated. Other than that it's a great place to stop. They give the new arrivals one drink at no cost. We will definitely come back here if we're in this area. We camped at Elk Lodge #849 in a Motorhome. Are you affiliated with Elk Lodge #849 ?